What happens when College Station hits 100,000? I’ve written before about my fascination with milestone numbers. My latest fixation — shared by plenty of my coworkers — is on this little beauty: 100,000. I’m referring to College Station’s population, which is currently just shy of this mark. 100,000: When will we get there? The safe answer is that we’ll get there soon. The 2010 Census showed College Station to be at 93,857. Believe it or not, just prior to the release of that figure, the population estimate calculated by our Planning & Development Services Office was 93,806 — a difference of only 51 and an astounding display of accuracy. College Station staff primarily bases population estimates on certificates of occupancy, or COs. Not all COs, but full COs, meaning that some properties are safe for living, but still have minor issues that prevent them from receiving a full CO, such as landscaping requirements or proper striping for parking lots. In fact, there’s a very large multi-family housing development on College Station’s west side that was occupied for nearly a year with a temporary CO, meaning its residents weren’t counted during that time as part of the city’s population. But upon achieving a full CO, we saw an instantaneous population spike of nearly 2,000 people. So, in reality, College Station has been at the edge of 100,000 for awhile — just not officially. And, yes, there are times when properties are removed, so the population is adjusted downward. Bottom line, with large-scale housing developments nearing completion in the Northgate area, look for us to officially cross 100,000 within a matter of weeks or months. Just how close are we? 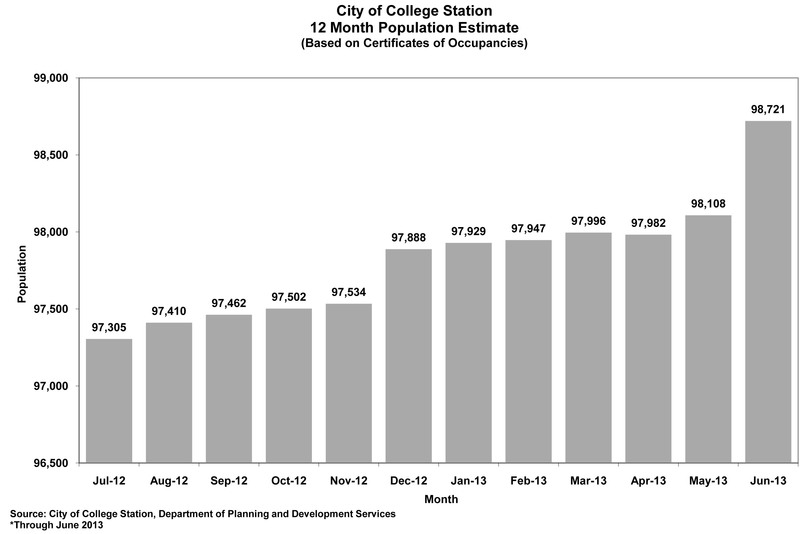 The June 2013 population estimate, released July 1, showed College Station at 98,721. President George W. Bush once described his management style in an intriguing way: “I’m the decider, and I decide what is best.” In this particular case, there’s no single internal “decider” at College Station City Hall when it comes to announcing 100,000 inhabitants; rather, it’s likely to be confirmed by a variety of sources: the aforementioned full certificates of occupancy; periodic U.S. Census updates; College Station ISD enrollment information; various utility customer counts and so on. While case law shows that cities have the ability to determine when 100,000 inhabitants are present, you can expect that process to be quite meticulous. Legalese alert: Only the U.S. Decennial Census can officially determine population; therefore, cities must estimate the number of inhabitants. But even the number of inhabitants can be influenced by factors such as extended-stay hotels. Who knew? City Council and candidates have to disclose what? Once the U.S. Decennial Census shows College Station officially crossed the 100,000 mark — 2020 will be the earliest year — the mayor and city council, candidates for those offices, the city manager and city attorney will be faced with filing lengthy and detailed personal financial statements for public review. 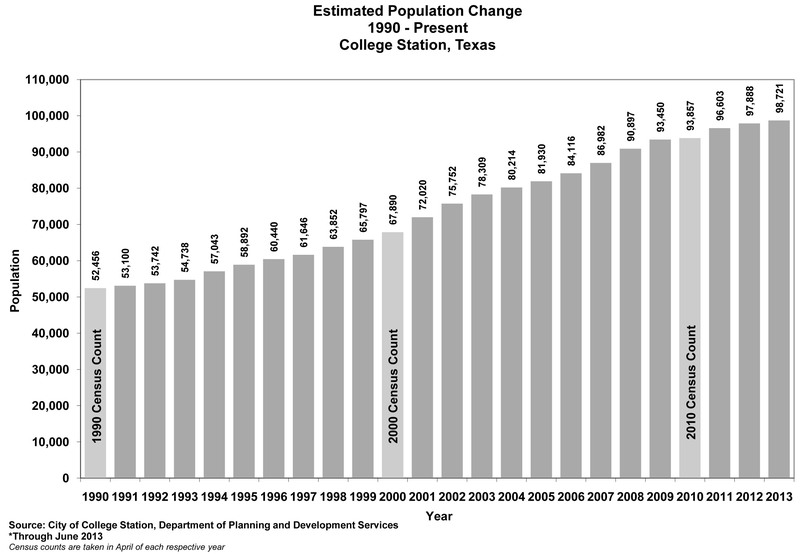 By 2020, College Station’s population is estimated to exceed 120,000. Well before 2020, however, the city is able to determine that 100,000 inhabitants live here so the city council can decide if and how to expand College Station’s extra-territorial jurisdiction, or ETJ. As a reminder, the ETJ is an area outside of the city limits that still falls under certain city requirements if subdivision occurs on that property. College Station’s ETJ extends 3.5 miles beyond its incorporated borders, but could extend as far as five miles if council elects to do so. There’s no time limit or even a requirement to make that decision, but it likely will be the focus of considerable discussion with city staff, City of Bryan officials and others. It’s worth repeating that the city council is allowed to make a decision about the ETJ when it’s determined College Station has exceeded 100,000 inhabitants because no official measurement by the U.S. Census is required. To help you understand College Station’s estimated monthly and yearly population changes, check out these charts provided by Planning & Development Services. According to U.S. Census Bureau estimates, there are 32 Texas cities — ranging from Houston (2.1 million) to Richardson (103,000) — with populations exceeding 100,000, and it’s safe to assume a few others, such as College Station, are on the cusp. Only about 300 cities in the United States have populations of at least 100,000. So, how do you feel about College Station, now in its 75th year as an incorporated city, joining this list? This entry was posted on July 8, 2013 by City of College Station. It was filed under City Council, Planning & Development, Public Communications and was tagged with Census, Growth, planning, population. I for one am loving more people coming to College Station. It gives our community more opportunities for bigger and better things to come to town. The downside that I foresee is the area becoming more urban and losing our identity as rural and country. I’ve always loved that College Station is a boots and blue jeans, pickup truck town. With more people coming in, is that going to go away? I hope not, but sadly fear that it won’t be as prominent as it once was. I’ve already seen the beginnings of it from moving here in ’07 to now. I do miss the little things about College Station when I was a child here. I loved having the biggest playground in the world on the A&M campus. We were free to roam the buildings, the campus, and Kyle Field. We were chased out of a few buildings while classes were in session. I miss not having to lock anything. We were latchkey kids but had no keys. College Station was Camelot to us. We felt safe. We didn’t need big theme parks, we had imaginations bigger than any Disneyland. I always wanted my children to grow up in a small town like College Station. Instead, they grew up in Austin. But our neighborhood there was a safe place. They grew up playing in Bull Creek. We grew up playing in Bee Creek. A city is what you make of it. We have the resources here and certainly the expertise to keep College Station a community that is inviting, safe, and fun for our children. We are fast working on providing good jobs and affordable housing. We certainly have great schools as always. Where we need to concentrate our efforts, is in maintaining the nice things we have. Does this count include Texas A&M Students, or just permanent residents of College Station? Caroline: It depends if we’re talking about population or inhabitants. For population, remember that only the Census can determine that (every 10 years). If any students — even those living on campus — report CS as their home on May 1 of the census year, then they’re counted. Meanwhile, city staff’s projections of inhabitants certainly includes students, but only those who live off campus. Make sense?